For other uses, see Grand Canyon Airport (disambiguation). 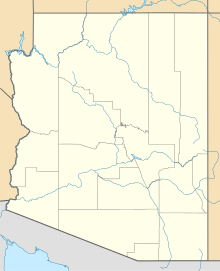 Grand Canyon West Airport (IATA: GCW, FAA LID: 1G4) is a public airport 60 miles (52 nmi; 97 km) northwest of Peach Springs, in Mohave County, Arizona. It is owned and operated by the Hualapai tribe and is on the Hualapai Indian Reservation. Federal Aviation Administration records say the airport had 137,771 commercial passenger boardings (enplanements) in calendar year 2017. The FAA's National Plan of Integrated Airport Systems for 2007–2011 classified it as commercial service - primary because it has over 10,000 passenger boardings per year. Passengers can fly from Las Vegas or drive (120 miles from Las Vegas) which includes newly paved road that was previously a rough stretch of dirt road. Plane, helicopter and bus tours are offered. The bus tours stop at Hualapai Ranch, Eagle Point and Guano Point. Eagle Point is home to the Grand Canyon Skywalk. 17/35 measuring 5,058 ft × 60 ft (1,542 m × 18 m) asphalt. In the year ending June 30, 2006 the airport had 130,300 aircraft operations, average 357 per day: 63% air taxi, 37% airline and <1% general aviation. ^ "Enplanements at All Commercial Service Airports (by Rank) (PDF)" (PDF). US Federal Aviation Administration (FAA). Retrieved 15 October 2013. ^ "Grand Canyon West | Hualapai Indian Reservation : SkyWalk". Arizona Leisure. Retrieved 15 October 2013. This page was last edited on 30 July 2018, at 23:19 (UTC).